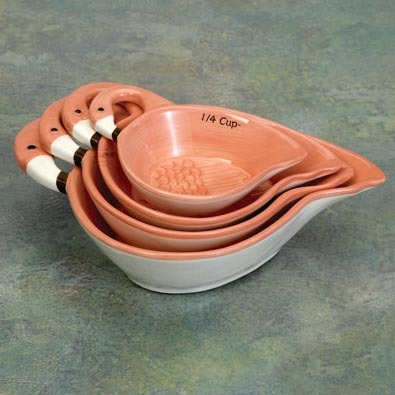 Bring some tropical flair to your kitchen and whimsical fun to your cooking with our vibrant set of coordinating flamingo measuring cups. This set of four is crafted of ceramic with a bright pink and white finish. Each spoon is imprinted with the measurement on the rim. When not in use the spoons are attached with a removable steel wire. Largest cup measures 8" x 5-1/4" x 2-1/4". Not for use in microwave. Bring some tropical flair to your kitchen and whimsical fun to your cooking with our vibrant set of coordinating flamingo measuring spoons. This set of four is crafted of ceramic with a bright pink and white finish. Each spoon is imprinted with the measurement on the rim. When not in use the spoons are attached with a removable steel wire. Largest spoon measures 2-3/4" x 6 x 1/2". Not for use in microwave.